Imagine this: you and your family sailing a yacht in the sparkling Ionian sea, flitting between islands and weighing anchor in idyllic coves for a beach barbecue or dip in the sea. Flotilla sailing is the way to go. A lead boat provides all the support and back up you need. And if you’re new to sailing, start off with a week of instruction. We offer a wide range of sailing holidays for beginners and experienced yachties of all ages. Flotilla sailing is one of the most fun – and safe – ways for a family or group of friends to enjoy a sailing holiday. Our flotilla base is in the Ionian, sailing around the islands of Lefkada, Meganisi, Kalamos, Kephalonia and Ithica. You will sail with other boats along with a lead boat, crewed by our own expert and unobtrusive team including a skipper, engineer and host. They are on hand to help with any advice and will follow a flexible itinerary to find the best coves, harbours and bays for a refreshing swim and comfortable overnight stops en route. If you and your family want to learn to sail and experience life on the ocean wave, check out our Stay and Sail Holidays. 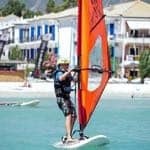 You will spend the week at our own Surf Club Vassiliki, where full instruction is on hand from our RYA-qualified team – as well as a huge range of other water sports – and then enjoy a week’s flotilla sailing for your second week. If at least one of you is experienced (ideally qualified to Day Skipper level), we also offer bareboat charters in the southern Ionian. Check out our fleet of yachts, sleeping up to eight. If you prefer, we can supply a skipper and/or host too. Explore our full range of sailing holidays and the latest special offers.